A beloved upstate New York giraffe who went viral when she gave birth to her fourth calf last year has predicted the winner of this year’s Super Bowl. 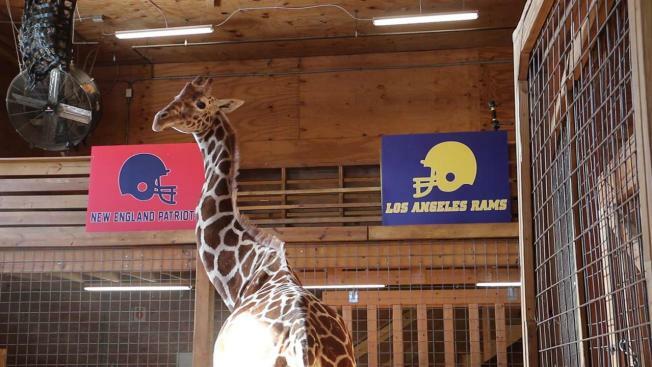 April the Giraffe, who lives at Animal Adventure Park in Harpursville, New York, picked the New England Patriots to win Super Bowl LIII on Feb. 3. It’s the second year in a row that April has picked the team, which will be playing the Los Angeles Rams at Mercedes-Benz Stadium in Atlanta. “April the Giraffe is proving to be quite loyal to our neighbors in New England,” Animal Adventure Park owner Jordan Patch said in a statement. “Every year, the park welcomes more guests from states like Massachusetts and Connecticut. We have a feeling they’ll like her prediction!” he added. April became a viral sensation when the park live-streamed the birth of her baby on YouTube in 2017. Tens of millions of people across the world watched the birth of the calf, who was dubbed Tajiri. Tajiri celebrated his first birthday this past spring.